Three out of four of the jobs worldwide are water-dependent. In fact, water shortages and lack of access may limit economic growth in the years to come, according to the 2016 United Nations World Water Development Report, Water and Jobs, which was launched on 22 March, World Water Day, in Geneva. From its collection, through various uses, to its ultimate return to the natural environment, water is a key factor in the development of job opportunities either directly related to its management (supply, infrastructure, wastewater treatment, etc.) or in economic sectors that are heavily water-dependent such as agriculture, fishing, power, industry and health. Furthermore, good access to drinking water and sanitation promotes an educated and healthy workforce, which constitutes an essential factor for sustained economic growth. In its analysis of the economic impact of access to water, the report cites numerous studies that show a positive correlation between investments in the water sector and economic growth. It also highlights the key role of water in the transition to a green economy. 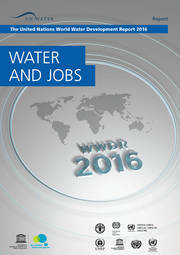 The 2016 Report includes IAHS contributions and will provide the content and basis for debate throughout the year on the global theme ‘Water and Jobs’ of this year’s World Water Day. The Report illustrates that nearly 3 out of 4 jobs of the global workforce (3.2 billion people) are moderately or highly dependent upon access to water and water-related services and therefore states that “Water is essential to decent jobs and sustainable development”. Water stress and the lack of decent work can exacerbate security challenges, force migration and undo the progress made in the fight to eradicate poverty. In order to disseminate these key findings and to add momentum to the official launch event in Geneva (22 March), WWAP is organizing an information meeting for the representatives of the Member States at UNESCO Headquarters in Paris on 24 March and at the UN Headquarters in New York on 14 April. In parallel, various UNESCO Field Offices with their national partners and United Nations counterparts are organizing regional events on the topic ‘Water and Jobs’, spread over the globe, notably Almaty, Amman, Bangkok, Beijing, Brasilia, Cairo, Jakarta, Montevideo, Nairobi, New Delhi and Tashkent. For the first time, the WWDR will not only be launched in English but also in Spanish and French. The Executive summary of the Report will be made available in all 6 UN languages as well as in Italian, Portuguese and Hindi.